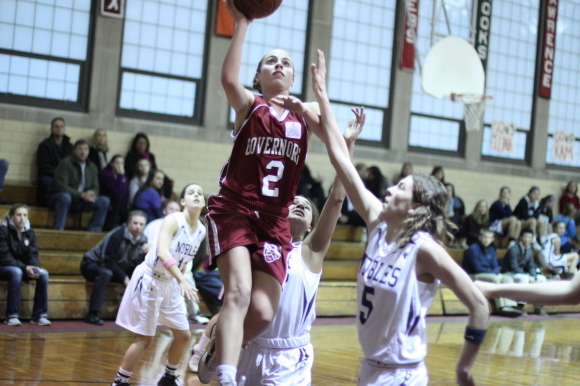 (Byfield) Noble and Greenough School (23-0) continued on their undefeated ways with a, 59-50, win over Governor’s Academy on Wednesday night in Independent School League action. The Bulldogs level of dominance in the ISL is mind boggling. They are a win away (on Friday at Milton Academy) of winning the 13-team league for the tenth straight season. Their won/loss record in ISL regular-season games during this amazing run? 117-2! Nobles came close to picking up an “L” against league member Rivers on Friday night. Rivers made only 13-of-28 free throws and missed two of them with no time on the clock in a 42-41 loss. Today’s game with GA wasn’t that close at the end. However, the Govs recovered from a bad start and had a two-point lead (38-36) with 9:40 left. Governor’s (17-5) were still within one-possession territory at 44-42 (6:23) and 46-44 (5:10). However, Nobles put a 10-2 segment together over the next 3 ½ minutes to get a commanding ten-point lead (56-46) with 1 ½ minutes left. GA couldn‘t recover. 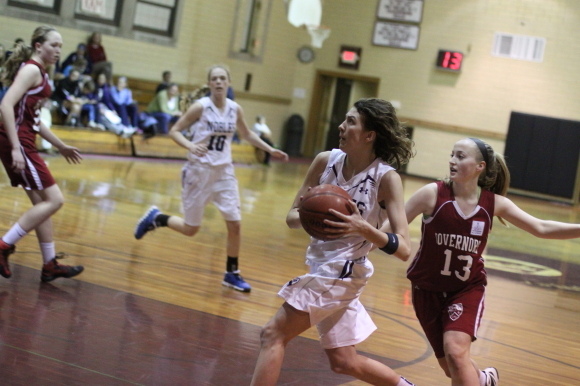 Kat Fogarty (27 points) put on another remarkable scoring show. The 6-1 Marist signee was trouble for Nobles every time she had the ball. Junior Kate Kerrigan was her primary defender and was solely interested in denying Kat the ball. When Kat did manage to get the ball, other defenders showed up to help Kate out. Despite this sort of coverage Kat was still able to get twenty-five of her points during the first twenty-seven minutes of the game. 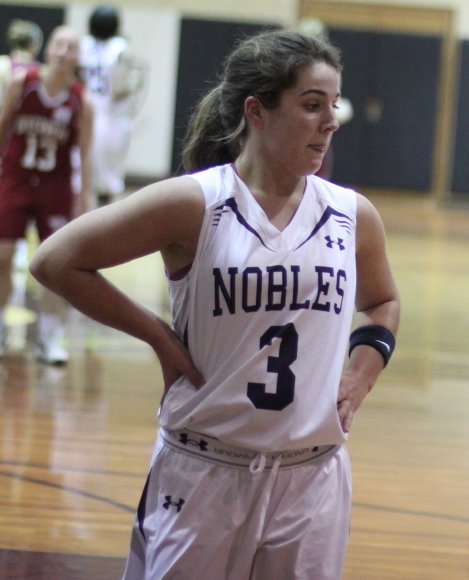 Holding Kat to only two points over the last five minutes of the game was certainly a reason why Nobles is still undefeated. 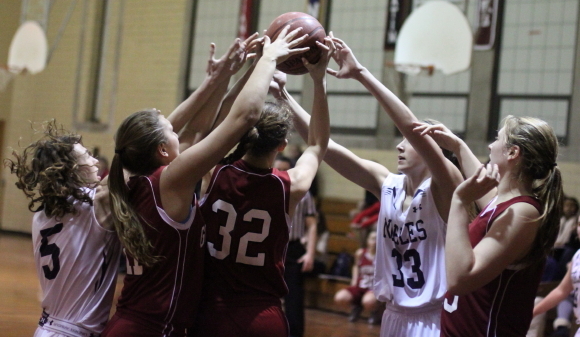 The visitors from Dedham jumped in front, 14-4, after six minutes. Two three’s by freshman Katie Benzan (15 points) were big in the fast start. The Govs put seven straight points together later in the half and got back to within two (18-16) with 5 ½ minutes left in the first half. Kat Fogarty had three free throws in this run while Jackie Ham assisted on layups by her sister Kendall (10 points) and Isa Berzanski. 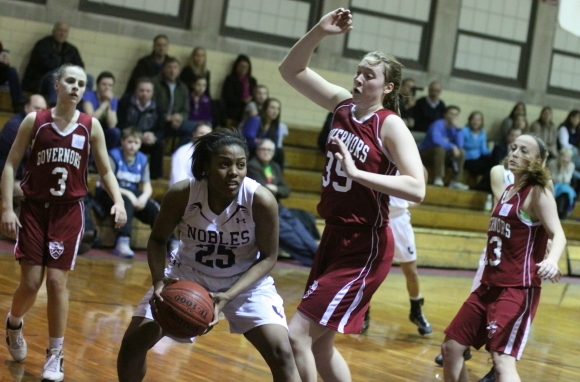 Nobles closed the half, 11-5, and led 29-21. Nobles had been winning games by an average of twenty-eight points so I thought they might take off in the second half. Didn’t happen that way. The Govs went down by nine (34-25) before Kat carried the team to a 13-2 collection with eleven points including two 3’s. 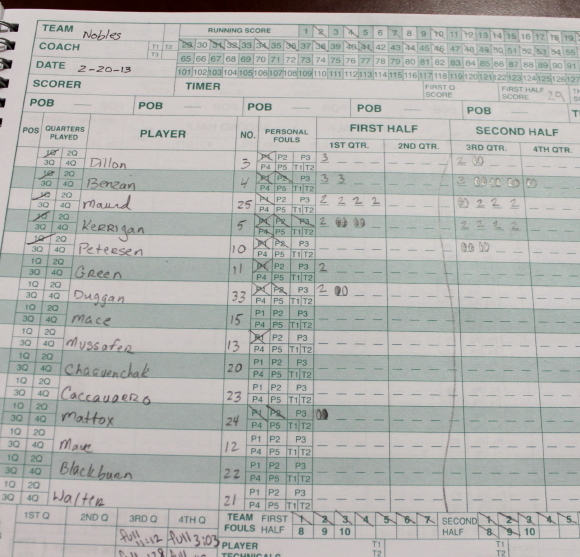 Those 4 ½ minutes of excellent offense put the home team in front (38-36) with 9:40 left. Down but definitely not out was Nobles. A drive by Kate Kerrigan (14 points) tied the score. 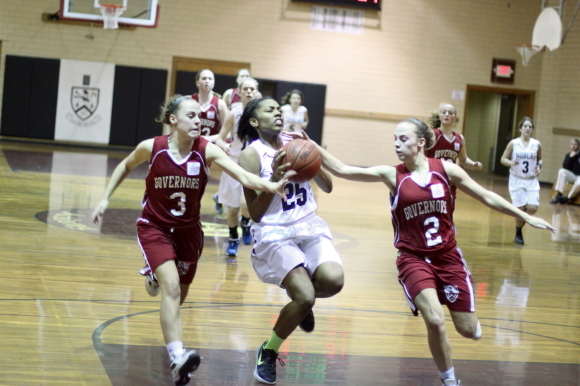 Then the junior stole the ball and put in another layup for the lead. 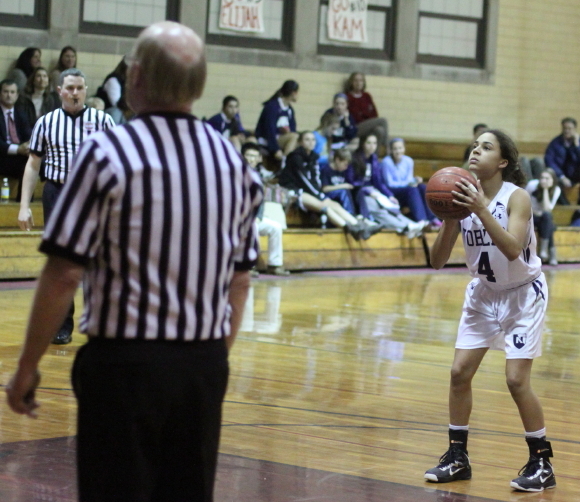 A Lauren Dillon free throw was followed by Kate Benzan’s third three. Nobles was now up by six (44-38). GA would close to within two (46-44) with five minutes left. Four free throws by Kat and two by Isa Berzanski provided the points. Over the next 3 ½ minutes the Govs would get a steal and layin by Kendall Ham but that would be the only scoring they were able to manage. 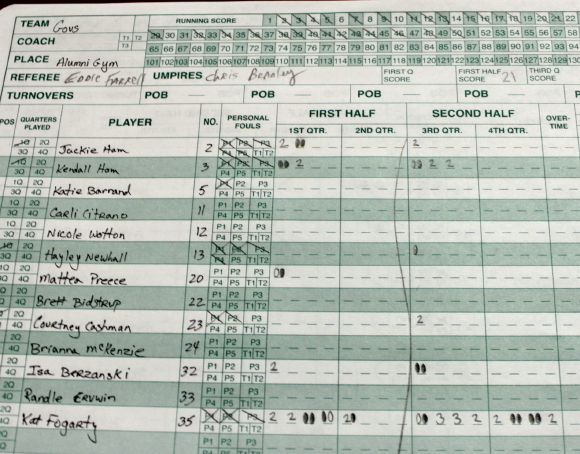 The other four points in the game-deciding minutes came on layups by Kate Kerrigan and Alexandra Maund (15 points). 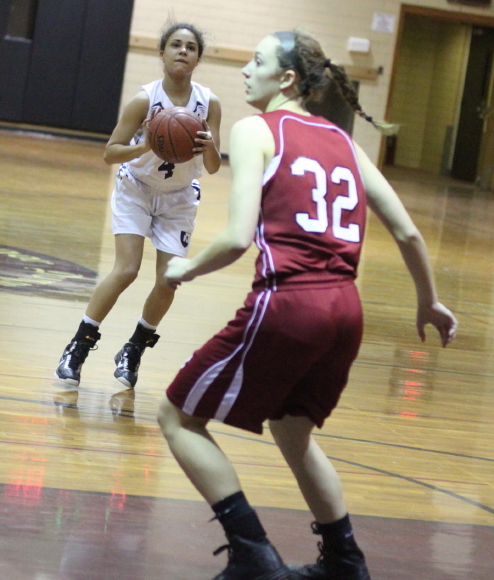 Alexandra’s layup was well set up by point guard Lauren Dillon. Lauren got by her defender into the lane and when Kat Fogarty came away from Alexandra to prevent Lauren from getting a layup Lauren’s pass set up Alexandra for a layup. That play worked several times over the course of the game. 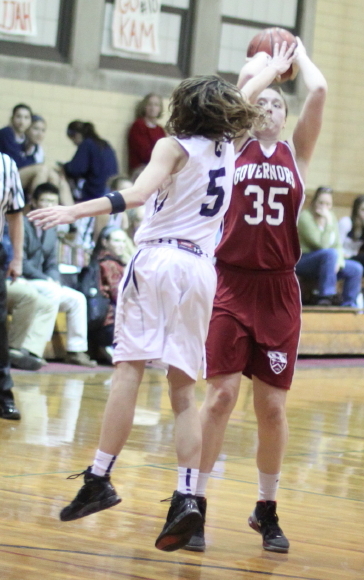 Kat Fogarty not only had twenty-seven points but also had at least four blocks. Nobles was 25-1 last season and won their first Class A title in twenty-five years. You’d have to like their chances of doing it again. Despite all the good players in this game there were still (by my unofficial count) forty-eight turnovers. Nobles was whistled for twenty-one of them. However, another key to the win was that only one of the miscues happened in the last four minutes of this game. Junior Lauren Dillon is an All-ISL selection in basketball and soccer. 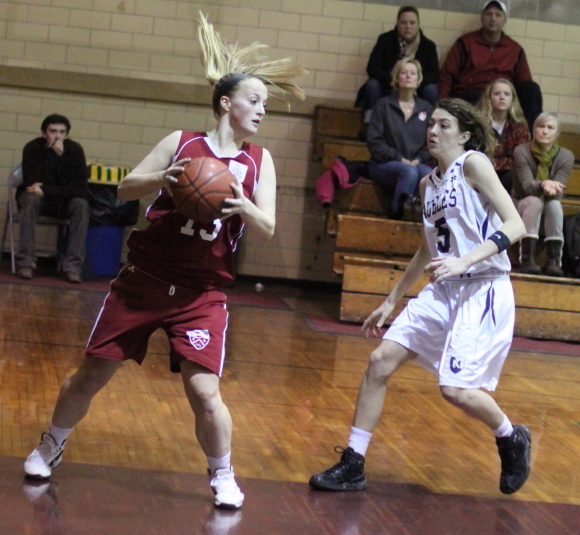 Junior Kate Kerrigan was the MVP in the 2012 NEPSAC Class A tournament. I thought that Nobles grad and Celtics co-owner Wyc Grousbeck might be in the audience but I didn’t see him. He was probably busy trying to decide if it’s time to trade Kevin Garnett and Paul Pierce.